Look what I just found! I couldn't believe my eyes. 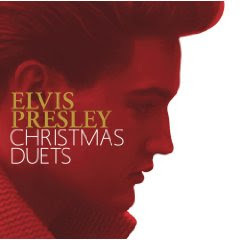 It is the perfect Christmas gift for my husband and probably for yours, too. It is simply too appropriate for someone who is obsessed with HDTV! Wouldn't it make a great gift? Available in a wide variety of styles and colors for both men, women and children through Film Maker Gear at Zazzle. 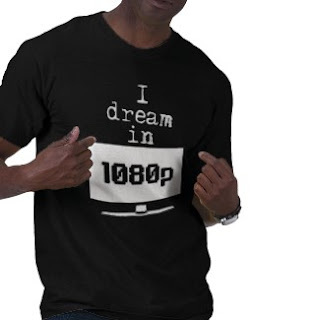 You can order your I dream in 1080p movie lover's t-shirt by clicking right here. 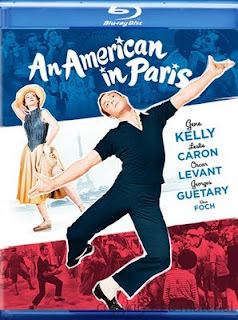 A blu-ray movie that I did see and did absolutely love, was An American in Paris. This 1951 George Gershwin film features Paris in the 1920s and starred Leslie Caron and Gene Kelly. It tells the story of an expat painter who falls for a French dancer while living in Paris. This film is a lovely and entertaining movie that is generally felt to have transferred extremely well to blu-ray. 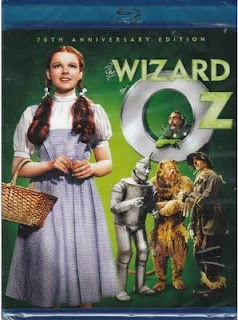 Blu-ray.com said, "...stunning restoration and video transfer, a solid presentation of the film's original mono track, and a well-rounded collection of supplements that adds a lot of value to the disc. If you're a fan of Gene Kelly classics or other notable musicals of the period, you won't be disappointed." This classic film was nominated for six oscars when it came out. Anyone who loves a fun, romantic story which features plenty of dancing and singing, is going to enjoy this. Anyone who wants to see their HDTV and blu-ray player perform, will love it! 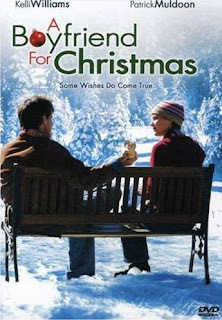 Christmas Blu-ray Movies ~~ Add One To Your Collection Now was my second page with a list of blu-ray movies on it. 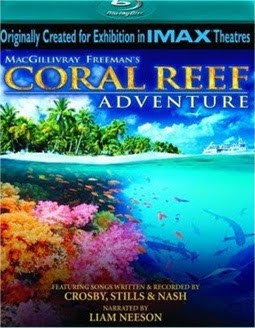 It was created a year ago when blu-ray movies were just starting to go down in price and become more readily accepted. 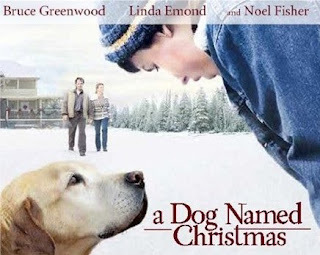 People who had adopted HDTV and blu-ray players needed to know what blu-ray Christmas movies were available and this page gave them the answer. 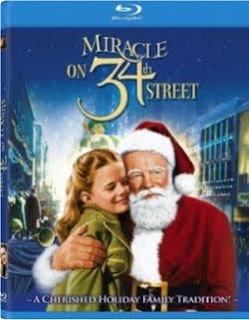 Although a year old, it still holds some great information about the eleven Christmas blu ray films that were available for Christmas 2008 and includes descriptions, videos and some great reviews of popular Christmas movies like The Polar Express, A Christmas Story and Holiday. If you are curious about what is available, take a peek. If you are looking for some of the best blu ray movies, I have a couple of lists that you might find helpful. 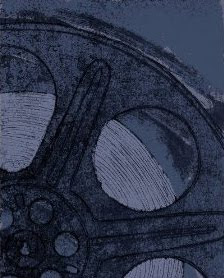 The first, Top 10 Blu-ray Movies For Best Picture & Sound Quality, is a list that was compiled based on Sound and Vision Magazine’s July/August 2008 issue. The film which took top honors at that time was Casino Royale which Amazon called, "the most brutal and viscerally exciting James Bond film since Sean Connery left Her Majesty's Secret Service" and Sound and Vision said this film had, "stunning sound and picture quality” both of which are still true and which still makes this a great action movie for your blu-ray player. An added benefit is that Amazon has it deeply discounted at just $21.99. That's an amazing $16.97 off the list price. The list itself may be somewhat dated but the movies on it are all still excellent choices. Visit Top 10 Blu-ray Movies For Best Picture & Sound Quality for the complete list and a discussion of the top ten movies that appear on it. I think you will agree that all of the films on that list are still great choices! We chose, indirectly, a Sony Playstation Blu Ray Player. I say indirectly because it was a surprise gift from Aunt Robin. She listened carefully to us talking about good blu-ray players and slid this one under our Christmas tree when we were not looking. I had read about the PS3 and its capacity as a blu-ray player and it seemed like a good choice. At the time, it was priced reasonably compared to many other blu-ray players and offered a quality, reliable machine with the added bonus of a game station. In a house with teenage boys, that was, as Martha Stewart would say, a good thing! Today, the Playstation has come down a bit in price but so have blu-ray players in general. If the gaming component of the Sony Playstation does not appeal to you, there may be a better standalone choice like the well-reviewed and economical Panasonic DMP BD60 1080p Blu-ray Player. However, if you can make use of the gaming functions, it is still worth making the PS3 a top contender on your short list. The Sony PlayStation Blu-ray Player ~~ The Best Blu-ray Player? Read more about the Sony Playstation Blu Ray Player at Amazon. The Panasonic DMP BD60 1080p Blu-ray Disc Player Black Review. Read more about the Panasonic DMP BD60 1080p Blu-ray Player at Amazon. This is my very first blog about my blu-ray experience. It's where I tell you a little bit about myself and how I wound up the owner of an HDTV and a blu-ray player and how my basement went from an undeveloped shell to a real room. I've told my entire story before on Brenda's Most Excellent Blu-ray Movies Adventure and shared bits and pieces of it on numerous other pages I've written on Squidoo but I thought it was time I branched out and shared my story with more people who might be interested. I was not a willing adopter of a high definition television nor of a blu-ray player. However, with an electronics-obsessed husband and two movie-loving teenage boys, I was definitely outnumbered. My husband had wanted a HDTV since the most basic ones cost thousands of dollars but, thank goodness, he determined that they were out of our budget at that point. Instead of re-mortaging the house, he decided to wait. He spent literally years waiting but during that period he was very active reading and researching and watching the prices. What he didn't spend during those years wound up under the mattress, almost literally. Every time someone in the house saved a few dollars on something, he would say that the savings were for the TV fund. He was the only one who knew that the TV fund really did exist and last year he gathered up all his socked-away funds and showed us that he had saved up the money for a new television. This is where you need to use your imagination and insert a picture of the boys and I falling off our chairs when he flashed all that cash at us. What an exercise in budgeting that was. I had no idea he knew how to save like that nor that he was capable of doing it. After he displayed his wealth, he went shopping and found himself a big, black Panasonic Viera TH-46PZ850U 50-Inch 1080p Plasma HDTV and his sister gifted us with a Sony Playstation 3 for Christmas. Yes, an over-the-top gift but a good choice in a blu-ray player that offers good quality and reliability and which doubles as a gaming station for teenagers. My husband used his hoarded cash to buy the television but he arranged to have it delivered much later...for first he had a basement to renovate. I do not think that he saved cash for that part of the job. I shared the story of our basement renovation on my blu-ray adventure page and even now I roll my eyes at the memory of the agony we went through to accommodate a new television. In future posts, I hope to share some of my new-found knowledge about HDTV, blu-ray technology and movies. I'll squeeze in some great music finds, too. I hope you'll stop back to see what I have discovered and to share your findings, too!